Download "We are more than happy to provide further information or engage in further discussions on any issues or initiatives of interest to the Commission." 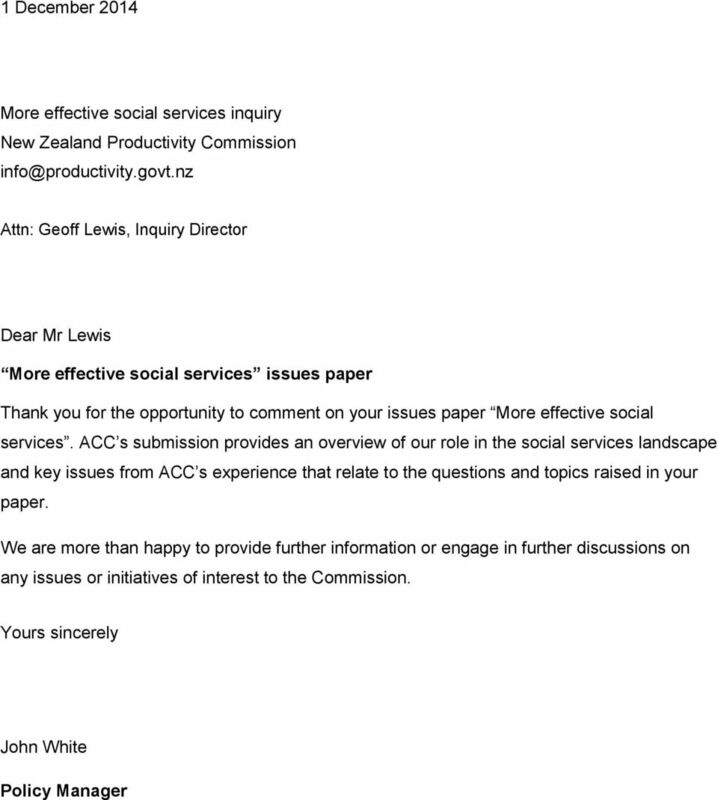 2 ACC submission to the New Zealand Productivity Commission s inquiry into more effective social services 1 Introduction 1.1 The New Zealand Productivity Commission s issues paper More effective social services is a wide-ranging survey of the issues surrounding commissioning and purchasing social services. ACC s submission does not address all the matters identified in the paper, but provides an overview of key issues we have identified that reflect ACC s particular role in the social services sector. 1.2 ACC is very willing to provide further comment on these or other issues, at the Commission s request. 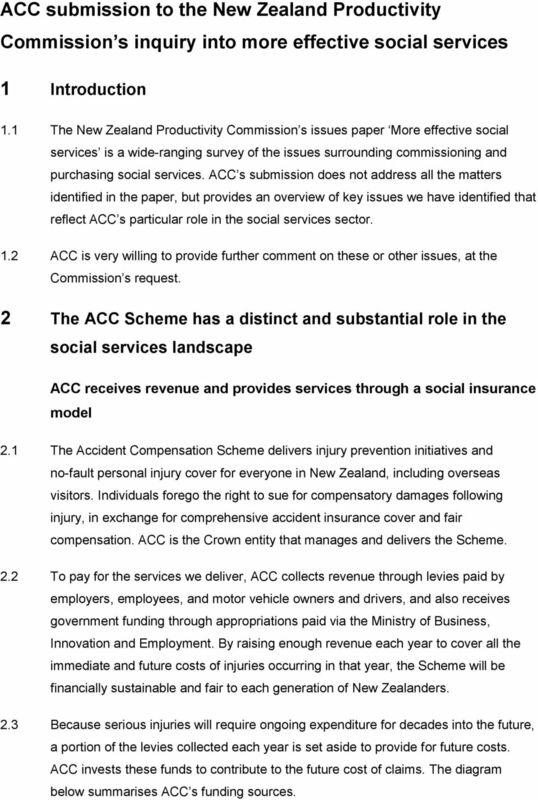 2 The ACC Scheme has a distinct and substantial role in the social services landscape ACC receives revenue and provides services through a social insurance model 2.1 The Accident Compensation Scheme delivers injury prevention initiatives and no-fault personal injury cover for everyone in New Zealand, including overseas visitors. Individuals forego the right to sue for compensatory damages following injury, in exchange for comprehensive accident insurance cover and fair compensation. ACC is the Crown entity that manages and delivers the Scheme. 2.2 To pay for the services we deliver, ACC collects revenue through levies paid by employers, employees, and motor vehicle owners and drivers, and also receives government funding through appropriations paid via the Ministry of Business, Innovation and Employment. By raising enough revenue each year to cover all the immediate and future costs of injuries occurring in that year, the Scheme will be financially sustainable and fair to each generation of New Zealanders. 2.3 Because serious injuries will require ongoing expenditure for decades into the future, a portion of the levies collected each year is set aside to provide for future costs. ACC invests these funds to contribute to the future cost of claims. 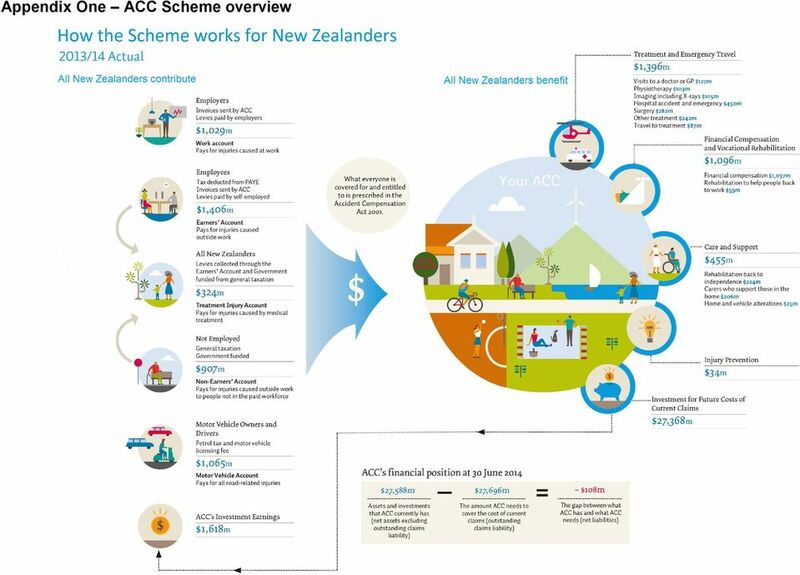 The diagram below summarises ACC s funding sources. 3 2.4 Appendix One provides more information regarding ACC s funding sources. 2.5 ACC funds treatment, rehabilitation and compensation for injured people through individual entitlements, which are available based on an individual s need and their situation before their injury. Treatment and rehabilitation entitlements can include funding for visits to general practitioners and other health professionals, elective surgery, and attendant care, such as help with showering, bathing and getting dressed. Weekly compensation is available when a person is off work because of an injury, and is usually paid at up to 80% of their average weekly income when they were working. 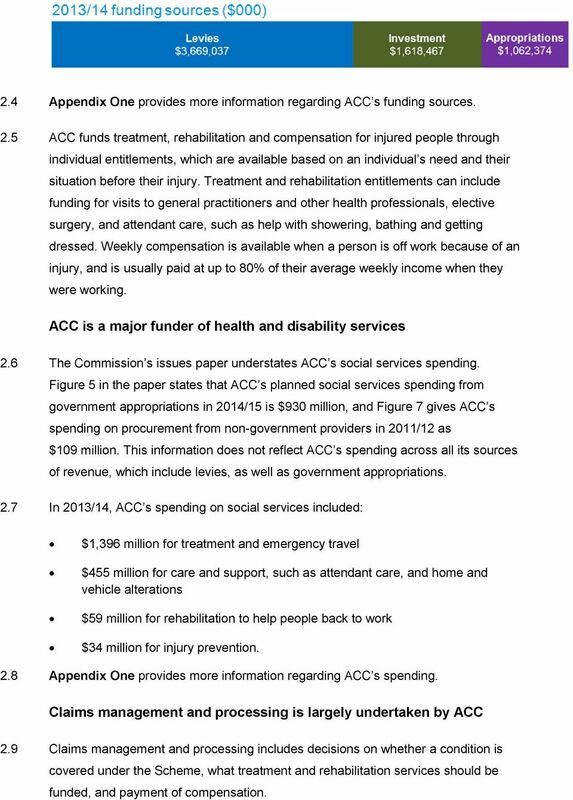 ACC is a major funder of health and disability services 2.6 The Commission s issues paper understates ACC s social services spending. Figure 5 in the paper states that ACC s planned social services spending from government appropriations in 2014/15 is $930 million, and Figure 7 gives ACC s spending on procurement from non-government providers in 2011/12 as $109 million. This information does not reflect ACC s spending across all its sources of revenue, which include levies, as well as government appropriations. 2.7 In 2013/14, ACC s spending on social services included: $1,396 million for treatment and emergency travel $455 million for care and support, such as attendant care, and home and vehicle alterations $59 million for rehabilitation to help people back to work $34 million for injury prevention. 2.8 Appendix One provides more information regarding ACC s spending. Claims management and processing is largely undertaken by ACC 2.9 Claims management and processing includes decisions on whether a condition is covered under the Scheme, what treatment and rehabilitation services should be funded, and payment of compensation. 4 2.10 Claims management and processing is largely undertaken by ACC directly. There is some external provision of claims management services through: the Accredited Employer Programme targeted at large employers. Under this programme, employers agree to take responsibility for managing their employees work injury claims. Accredited employers can engage a third party administrator (TPA) to help them manage claims a trial of TPA management of non-work claims for staff of accredited employers. This allows for an integrated claims management service for these employees, with a single point of contact for work and non-work claims. Employees can choose to have their non-work claims managed by ACC instead of the TPA ACC has different streams of claims processing and claims management, for different types of claims. The overwhelming majority of ACC claims require treatment only, and these are generally not actively managed. For claims that require greater support, short-term claims centres and branches provide active management. Branch services include specialised streams for serious injury and long-term claims. Claims for the impact of sexual abuse (known as sensitive claims) are managed by a specialised unit. Treatment and rehabilitation services are delivered by external providers 2.12 Treatment and rehabilitation services are delivered by external providers in the private health and disability sector and the public health system. 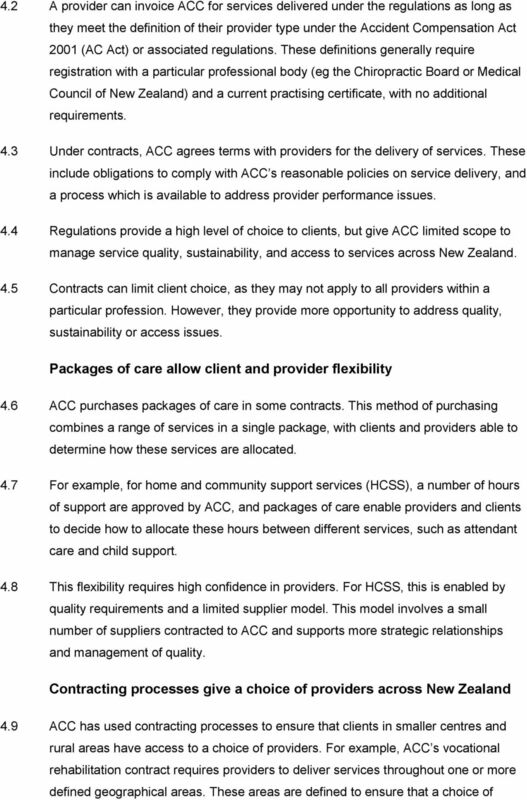 This approach to service delivery reflects a long-established model, where ACC is a funder and not a provider of treatment and rehabilitation services. ACC is undertaking a three-year transformation programme 2.13 The Shaping Our Future programme was set up in October It is a three-year programme to better meet the needs of our customers and restore public trust and confidence ACC needs to give our customers (injured people, levy payers and rehabilitation and health professionals) more choice on how they interact with us whether face-toface at our branch offices, over the telephone or online. 5 2.15 ACC needs to better meet customers needs and expectations with timely and accurate decisions and payments and simplified processes and by improving the capability of ACC staff. And we are improving how privacy is built into processes, including information-sharing practices with third parties Shaping Our Future includes examining our people, processes and technology. In the coming months we will get a greater level of understanding about how our organisation needs to work in the future and how it can best meet the needs of New Zealanders. 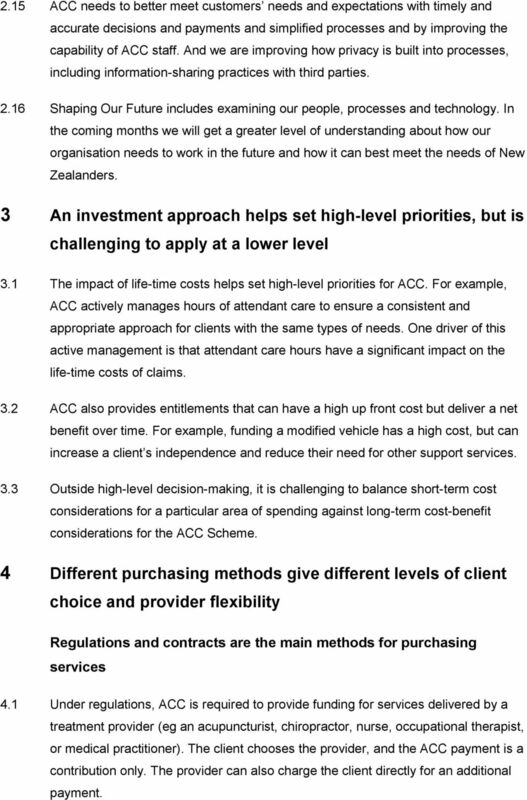 3 An investment approach helps set high-level priorities, but is challenging to apply at a lower level 3.1 The impact of life-time costs helps set high-level priorities for ACC. For example, ACC actively manages hours of attendant care to ensure a consistent and appropriate approach for clients with the same types of needs. One driver of this active management is that attendant care hours have a significant impact on the life-time costs of claims. 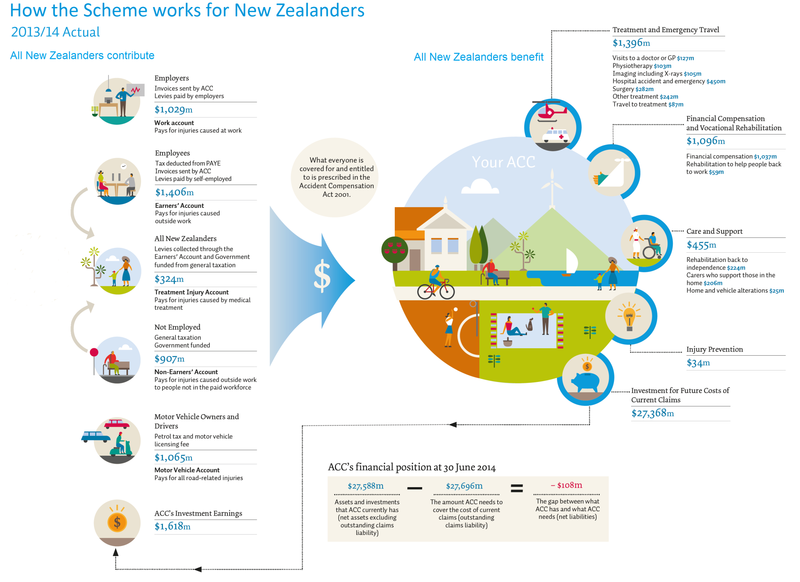 3.2 ACC also provides entitlements that can have a high up front cost but deliver a net benefit over time. For example, funding a modified vehicle has a high cost, but can increase a client s independence and reduce their need for other support services. 3.3 Outside high-level decision-making, it is challenging to balance short-term cost considerations for a particular area of spending against long-term cost-benefit considerations for the ACC Scheme. 4 Different purchasing methods give different levels of client choice and provider flexibility Regulations and contracts are the main methods for purchasing services 4.1 Under regulations, ACC is required to provide funding for services delivered by a treatment provider (eg an acupuncturist, chiropractor, nurse, occupational therapist, or medical practitioner). The client chooses the provider, and the ACC payment is a contribution only. The provider can also charge the client directly for an additional payment. 7 service provider is available to all New Zealanders. For example, Northland is included within the same area as Auckland, which means that providers who apply to deliver services in Auckland must also do so in Northland. 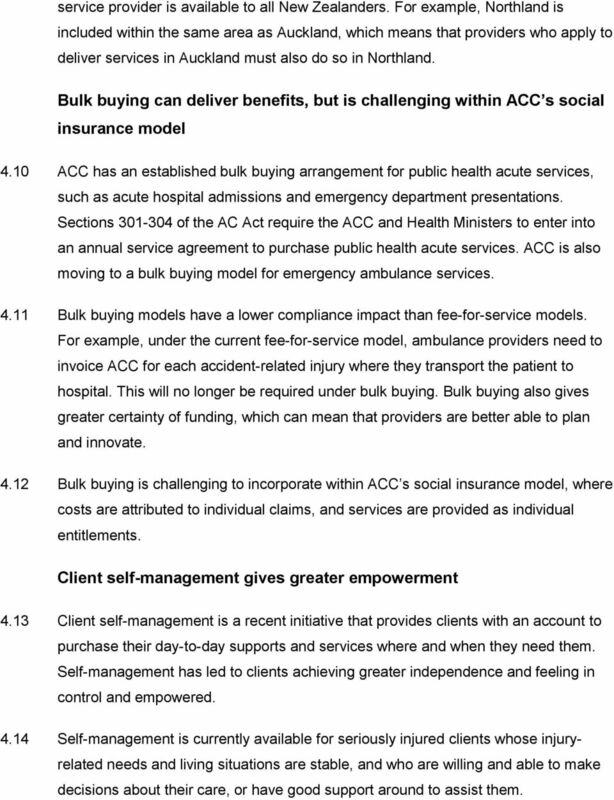 Bulk buying can deliver benefits, but is challenging within ACC s social insurance model 4.10 ACC has an established bulk buying arrangement for public health acute services, such as acute hospital admissions and emergency department presentations. 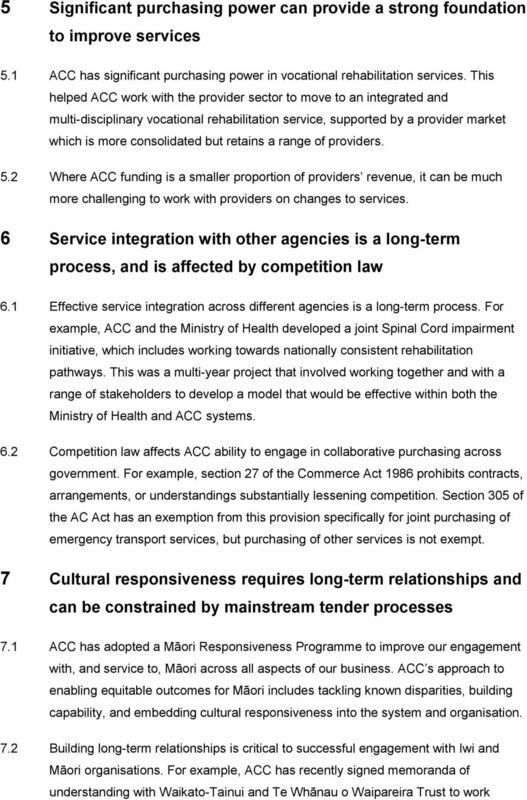 Sections of the AC Act require the ACC and Health Ministers to enter into an annual service agreement to purchase public health acute services. ACC is also moving to a bulk buying model for emergency ambulance services Bulk buying models have a lower compliance impact than fee-for-service models. For example, under the current fee-for-service model, ambulance providers need to invoice ACC for each accident-related injury where they transport the patient to hospital. This will no longer be required under bulk buying. Bulk buying also gives greater certainty of funding, which can mean that providers are better able to plan and innovate Bulk buying is challenging to incorporate within ACC s social insurance model, where costs are attributed to individual claims, and services are provided as individual entitlements. Client self-management gives greater empowerment 4.13 Client self-management is a recent initiative that provides clients with an account to purchase their day-to-day supports and services where and when they need them. Self-management has led to clients achieving greater independence and feeling in control and empowered Self-management is currently available for seriously injured clients whose injuryrelated needs and living situations are stable, and who are willing and able to make decisions about their care, or have good support around to assist them. 9 together on areas of common interest, including the prevention of violence, sexual violence and alcohol abuse, opportunities for Whānau Ora relationships, and community outreach initiatives. 7.3 Tender processes are a challenging area for improving responsiveness to Māori and Pasifika people. Tender processes follow a standardised and mainstream practice, which can be ineffective in engaging with Māori and Pasifika providers. A society that highly values our lives and continually enhances our full participation. LIVINGCARE APPENDIX OPTIONAL BENEFIT DISABILITY INCOME PROTECTION BENEFIT AGREED VALUE BASIS This appendix only applies if you have chosen a disability income protection benefit on an agreed value basis. A responsible, sign. team up. front. Committing to where we re going and putting our hearts into what we do. We get engaged every day. Reducing Red Tape. Implemention Review. Version 2.0. Department of Family and Community Services NSW May 2011 - Last updated June 2012. Citation: Ministry of Health. 2010. Health Expenditure Trends in New Zealand 1997 2007. Wellington: Ministry of Health. Prepared April 2004. Source: Draft originally prepared for Ministry of Finance, Lesotho.